Burt (6-4, 200) has developed in to the top receiving target for Mustangs this season. Through five games, Burt has equaled his 2017 output with 30 receptions, but has 564 receiving yards and nine touchdowns. Last season, Burt caught 30 passes for 404 yards and three scores. Burt has caught at least one touchdown pass in each game this season, and had three touchdowns and 140 receiving yards in the Mustangs’ 52-42 win over Blue Valley West. That is the game that Blue Valley North played without senior quarterback Graham Mertz. Mertz returned last week in a win over Mill Valley, and connected with Burt six times for 76 yards and two scores. Burt will most certainly get the 32 yards this week to put him over 1,000 receiving yards in his career. The Mustangs will go for a third straight win on Friday when they host Blue Valley Southwest. Dalen Kistner of Hartford has enjoyed a lot of success this season as he has passed for 1,171 yards and 13 touchdowns in the Jaguars first five games. Kistner is passing for 239.2 yards per game. He should see some success through the air and on the ground against winless Marais des Cygnes Valley this week. After five weeks of the season, Kistner ranks second in 8-man passing yardage on our Sports in Kansas leaderboards, second only to Garrett Burden of Medicine Lodge (1,272 yards). Kistner had 375 yards passing, 94 yards rushing and six total touchdowns last week. His most impressive stat was 34 tackles in the loss against Wakefield. While I considered taking him as a defensive player this week, I'll stick with him on offense. Weskan junior Jace Mackley earned Kpreps six-man all-state honors last fall at quarterback. This year, he has helped the Coyotes to a 2-2 start. Weskan has averaged 52 points a game this season. After a bye last week, Weskan has a key home matchup with Golden Plains (5-0) this Friday. Mackley has completed 91 of 131 passes for 1,045 yards with a 19/4 TD/INT ratio. Four receivers have between 18 and 21 catches. He has 28 rushes for 193 yards and three scores. Two years ago, Weskan captured the inaugural six-man title. Last season, the Coyotes lost to Golden Plains in the regular season, 59-12, and then beat the Bulldogs, 44-27, in the consolation game to take third. Pedigo missed Hoisington's season-opener, a blowout loss to Class 3A No. 4 Pratt, but has made up for lost time in the four games since. In leading the Cardinals to four straight wins, Pedigo has rushed for 914 yards and 14 touchdowns. The junior back, who also is a returning state wrestling champion, torched Larned for 323 yards and five scores and is coming off putting up 283 yards and four scores against Ellsworth. Hoisington will take on Minneapolis on Thursday night in a game moved up one day due to the threat of weather. The Lions gave up 300 yards on the ground to Beloit earlier this year. Salina Central running back Taylon Peters is in the midst of an outstanding senior season. Peters has rushed for 981 yards and 13 touchdowns through five games, and most importantly, his Mustangs sit at 4-1 an amount the top three seeds on the west side of Class 5A. Last Friday, Peters celebrated his birthday by rushing for 285 yards and three touchdowns as Salina Central beat Haysville Campus, 48-17. This week, the Mustangs will travel to Newton to take on the Railers (2-3). Salina Central has been one of the state’s biggest surprises this season under new coach Mark Sandbo. The Mustangs entered the 2018 season on an 18-game losing streak. The Panthers have been one of the most dominant programs over the past few years and a big part of that success has been how productive their offense has been. The Panthers have scored at least 30 points in all five games thus far this season and will have a good shot at reaching that mark again on Friday night against Ellsworth (1-4). Ellsworth gave up 48 points and 486 yards of offense to Hoisington last week. Hoisington and Phillipsburg have two pretty similar offenses with a lot of firepower, so look for Phillipsburg to put up 40+ points on Ellsworth and it will all start up front with the lineman to clear the routes to the end zone. A big reason Shawnee Mission South is in the midst of one of their best seasons in years is the play of senior quarterback Jack Roberts. The 6-4, 185-pound dual-threat QB has passed for 584 yards and nine touchdowns through five games to go along with 624 rushing yards and three more scores. His mix of size and speed is garnering interest from college programs including Emporia State and Missouri Western. Last weekend, Roberts took a visit to Wyoming. Also one of the state's top javelin throwers, Roberts could be poised for a breakout game against Lawrence. Since a 23-22 victory over defending 5A champion Bishop Carroll to open the season, Wichita Northwest has averaged nearly 56 points per game. 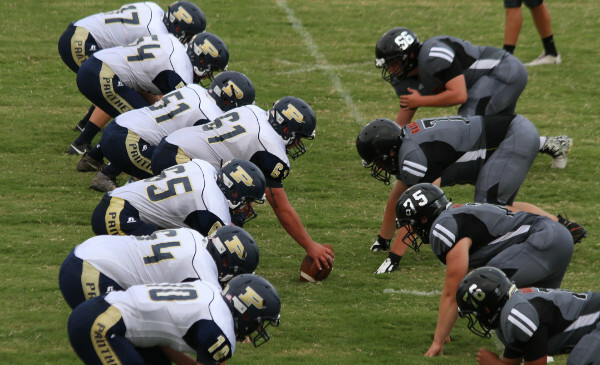 The Grizzlies are also statistically the state’s top offense in averaging 495 yards of total offense each time out. That’s nothing new under coach Steve Martin. The Grizzlies have consistently been among the top offensive units in the state and set the state record for average total yards per game in 2016 with a 546.8 average. We know about the Grizzlies multitude of playmakers including Breece Hall, Regan Jones, and Roy Johnson, but the guys up front have been getting the job done as well. Northwest’s offensive line played well last week in putting up 539 yards and 55 points against a Kapaun Mount Carmel defense that was allowing only 7 points per game. On Friday, Wichita Northwest travels to Garden City to take on the Buffaloes. Garden City has won two straight games since an 0-3 start that saw them surrender an average of 39 points per game. This will be the seventh meeting between Grizzlies and Buffaloes in the past six seasons. Wichita Northwest has won four of those six meetings, including both meetings last year. In those head-to-head matchups, the Grizzlies have averaged 38 points per game.